What can be anymore tempting on a hot summer's day than this luscious chocolate pudding? Can there be anyone who won't drool at the thought of tucking into an iced chocolate mousse? Make it today, it's so easy! 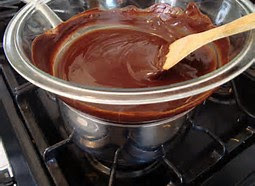 Put the chocolate and the water in a heatproof bowl and heat over a saucepan of simmering water until melted. 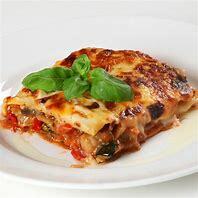 Take off the heat and leave to cool slightly. Whisk the egg yolks and the sugar in a bowl until thick and fluffy. Whisk the chocolate into the egg yolk mixture. 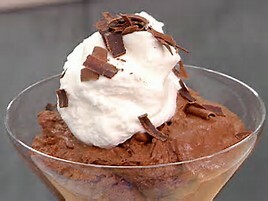 Whip the cream until it stands in soft peaks, then fold the cram into the chocolate mixture. Whisk the egg whites until stiff. Fold 1 tablespoon into the mousse, then fold in the rest. Pour the mousse into 8 small dishes or 1 large one, and chill in the fridge. Decorate the mouse with whipped cream and the grated chocolate.